Derry City Chairman Philip O'Doherty. Derry City are not expected to play any football at Brandywell until the 2018 season! Chairman, Mr. Philip O’Doherty, confirmed the news that the club is actively searching for alternative grounds for next season. “It looks increasingly likely that the club will not be in the Brandywell for a year,” he stated. “At the minute the work hasn’t started and it’s a 10 month project, so yes it looks unlikely that we’ll be playing in the Brandywell next season. “We are actively looking for an alternative venue, but that ground has to come up to FAI standards and UEFA standards,” noted the chairman. Although he refused to be drawn on what grounds would be in play, it’s expected that the local GAA ground Celtic Park, Maginn Park in Buncrana and Institute’s Riverside Stadium, would be investigated, Mr. O’Doherty said that an alternative ground would have to be finalised by January. “We start our licensing application in the next few weeks and obviously as part of that we need to state where we are playing next season. We are hoping we might get a wee bit of leeway as we are likely to be out of the Brandywell for a full season,” he added. “At the moment we are trying to sort a few things out as regards a ground, but there’s nothing concrete so I will not be speculating. Having completed a very successful campaign, under Kenny Shiels’ management, Derry will be looking for a more positive season next term having secured European football for next season. While Celtic Park would more than likely get the thumbs up for Europa League football if available, neither Institute nor Maginn Park would be suitable. However, the Sligo Showgrounds may well be the more realistic venue for City’s 2017 Europa League campaign. 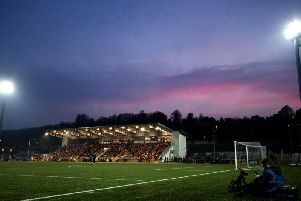 What is certain, is that work is expected to begin on the redevelopment of Brandywell Stadium later this month, Derry City and Strabane District Council confirmed a few weeks ago.